A richly nuanced synthesis of history and suspense. One of New York City's most haunting buildings is the Deadhouse. This abandoned structure -- which sits on a small island in the middle of the East River like the ghostly remains of a castle -- plays in the imagination as a likely place for murder. Opportunistic murder seems unlikely as assistant DA Alexandra Cooper uncovers a distressing pattern of betrayal and terror. There's proof that Lola's husband wanted her dead. And why did Lola have a photograph of Charlotte Voight pinned to her office bulletin board? Charlotte left her dorm room eight months ago and vanished into the night. Are they both victims of the same predator? 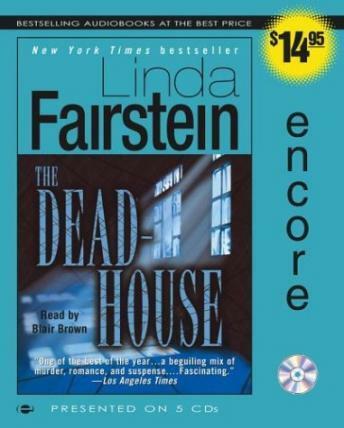 Perhaps most puzzling of all are the words 'The Deadhouse.' What was Lola's connection to this desolate place where people once endured slow and agonizing deaths? And what danger awaits Alex as she targets Lola's killer? This book was great up until the end - The autor seemed to rush thru the ending. In a matter of minutes the mystery was solved and the book was over. Other than that, it was a good listen and very interesting.